Soaring temperatures and humidity in New York these past days are not particularly stimulating to start working on a fall wardrobe. I must admit, usually, fall pieces lounge on my work table waaay past winter months. So, actually, I am quite happy I had an early kick-start, and here is the latest project, made after a month-long holiday break. With the help of Susan Khalje – founder of the Couture Sewing School, author of Bridal Couture, and contributing editor to Threads magazine – I made a couture version of the Godet Pencil Skirt from the August 2012 issue of burda style magazine.The project (which is also a of my couture wardrobe challenge on burdastyle.com) is relatively easy – a straight skirt with an in-seam godet. I like this small detail, which adds playfulness to the otherwise formal style. Besides, I am sure I will get a lot of wear out of this skirt. But what’s in it for you, readers? 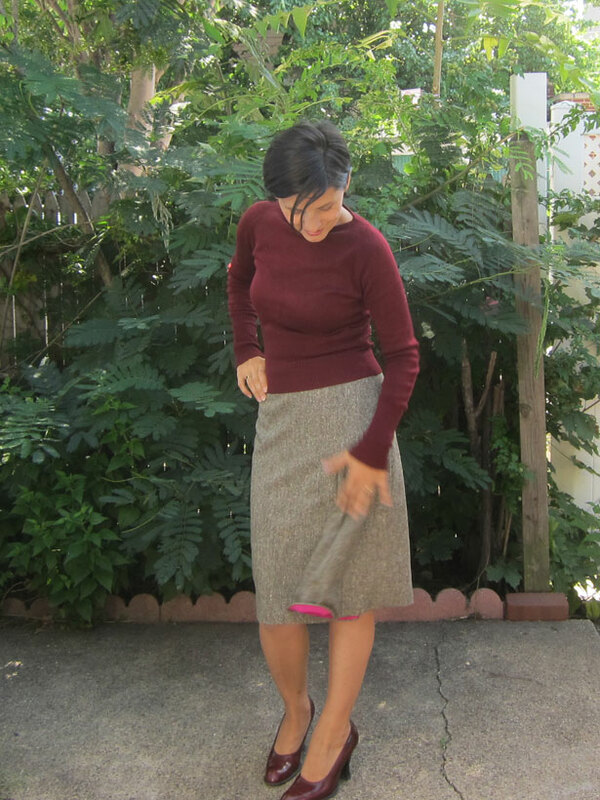 Well, I chose this style for the challenge because of the godet and all the related construction, which can sometimes be really tricky.Wool tweed was my choice for the style, so I decided to line the skirt for the wearing comfort. I underlined all sections, except for the godet, in China silk (sometimes also called silk habotai). 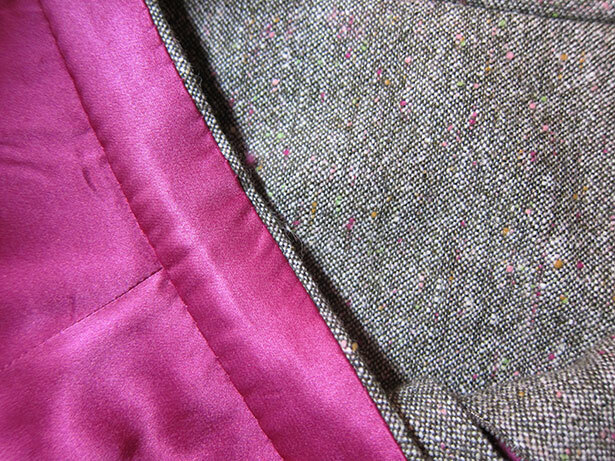 As lining I chose silk charmeuse, my favorite to line wool as it makes it feel very soft and drapey from the inside. Finally, I used a small piece of powernet for a godet stay. 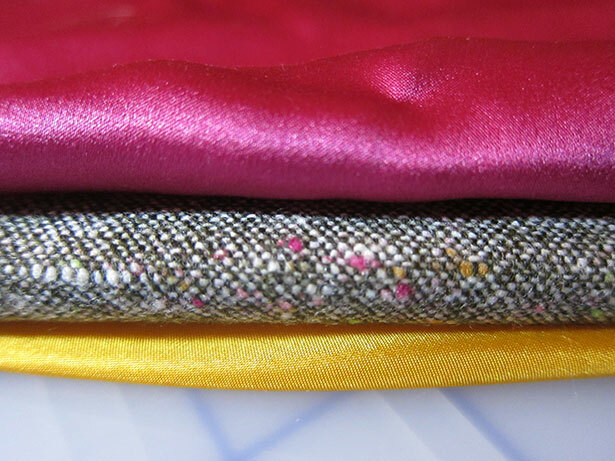 I was lucky to source all fabrics at Mood – it saved a lot of time and legwork. Because godets are usually cut on straight grain, the vertical edges of the wedge will always have some degree of bias. This requires careful handling to avoid fabric distortion. After two days, the vertical edges on the lining stretched out almost an inch forming a heart-shaped wedge, while the tweed hardly stretched out at all. If you worked with bias before you would probably just shrug your shoulders, but I always get excited about the results imposing my observations on my family as a dinner conversation topic…okay, back to the godet. I retraced both pieces aligning lengthwise grains. Underlining was skipped to reduce bulk, especially at the top of the godet piece. If the godet is relatively wide, a quarter of a circle or more, I would also taper the vertical edges at the tip of the wedge. The godet in this skirt was not as wide, but considering the weight of the fabric, I wanted to reduce the bulk at the tip as much as possible. I measured down approximately 4” from the tip, then, took out ¼” on both sides of the wedge, gradually blending it with the original seamline on both sides. 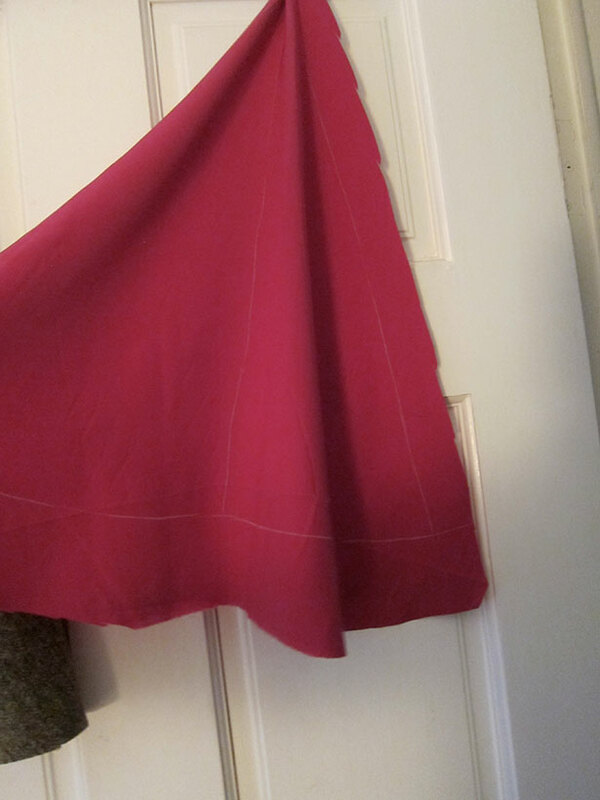 It is possible to make this step on the pattern and then cut accordingly, but I preferred to do it after hanging out, retracing and hemming on the final godet piece. If you do it the same way as me, make sure you adjust your seamline markings accordingly and sew along the new tapered line. I found some information on the construction of godet stays in a Threads magazine article on Hillary Clinton’s 1993 inaugural gown (Threads, Issue 51, February/March 1994). 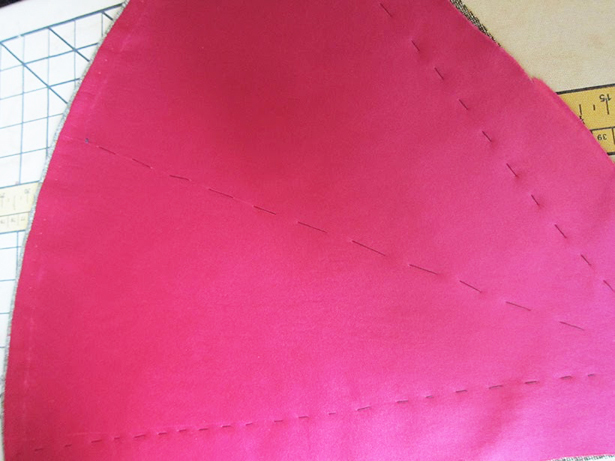 As one of the construction secrets, the author explains the use of a spandex insert to control a fish-tail godet in the back of Clinton sheath skirt. Using stretchy fabric for the stay is a perfect solution: it controls the figure-hugging shape, but, at the same time, allows for movement. I made my stay from a nylon powernet and sewed it by hand to the godet piece. The stay is 5” long and 3” wide. Following Susan’s advice, I pressed all seam allowances towards the skirt, so they were all covered up once the skirt lining was sewed in. 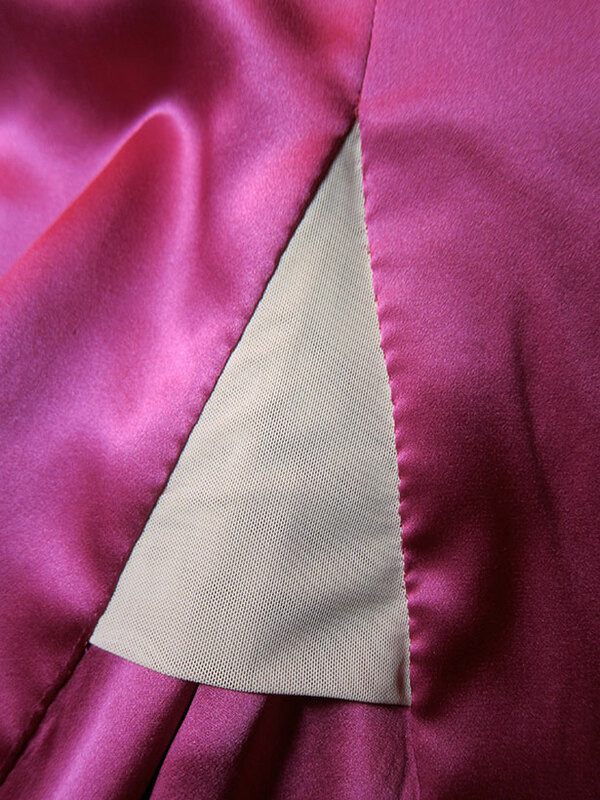 Since I covered a lot of couture finishing techniques in my previous posts, I will only show the details that are different here. 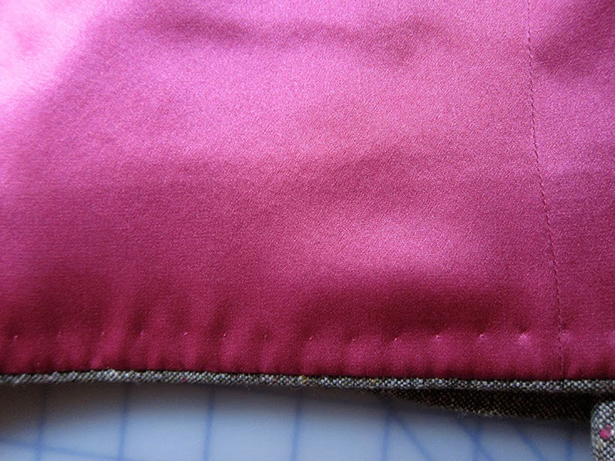 I didn’t use the ease pleat to hem lining, but sewed it edge-to-edge using tiny fell stitches. 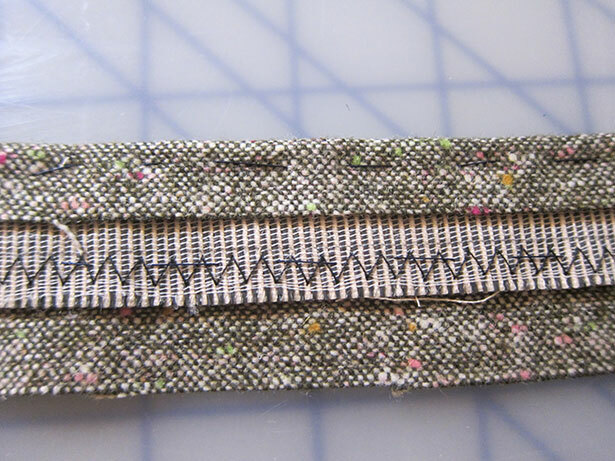 Finally, as a personal preference, I decided to go for a faced waistband – a technique I learned from Claire Shaeffer’s Couture Sewing Techniques, Revised and Updated (p. 111). The waistband is faced with the same lining fabric as the skirt and feels great against the skin. I am really happy with the skirt and can’t wait for the fall to start wearing it. My favorite feature is the godet and the contrasting bright lining, which does show off when I sit. 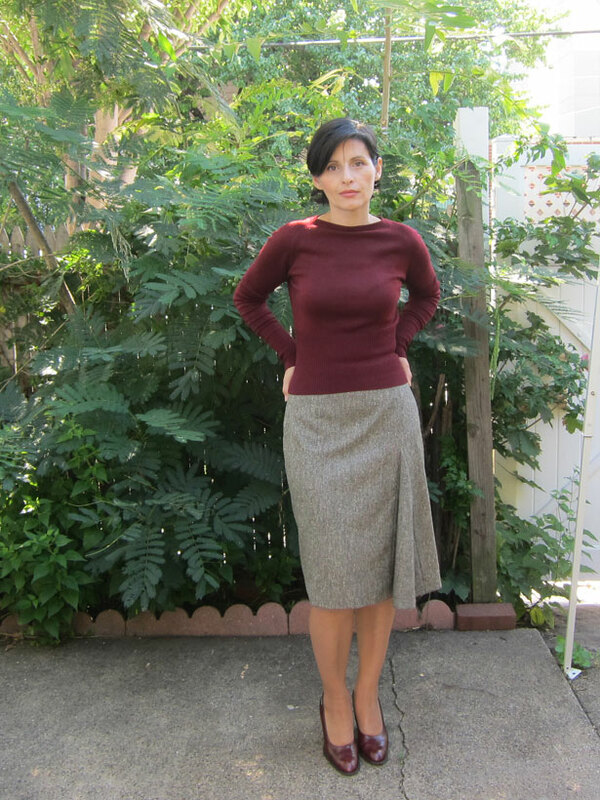 That’s it – no boring tweed pencil skirts this year! 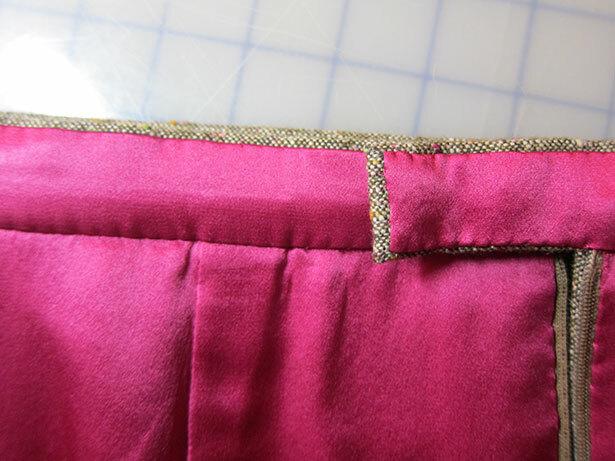 Setting-in an in-seam godet, step-by-step.